I have dual booted with Windows, I have allocated Windows for 180GB and For Ubuntu 46GB. Recently I wanted to increase Linux root partition hard drive space and I shrink from windows and unallocated space created. Now I cannot shrink it to boot partition of Linux, Whenever I tried to click resize/move on /dev/nvme0n1p4 it simply says there is no unallocated space to add. I tried Gparted live boot also, I get the same response. Now I want to merge all the unallocated to space to my Linux root partition(/dev/nvme0n1p4) how to do it? And Why am I having 3 separate unallocated space? Can I not merge them to single? The filesystem is already 12207104 (4k) blocks long. Nothing to do! It appears that your goal is to provide more space on your / mounted partition. AndroidDev has done a fine job explaining why a number of options aren't a good fit for you in the numerous comments. Any large directory in your / mounted partition can be copied to a new partition created in your unallocated space. 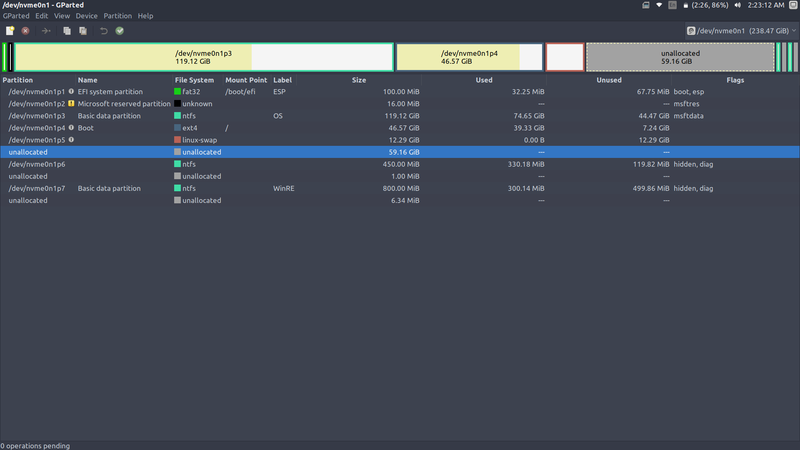 You can find an appropriate candidate by using Disk Usage Analyzer AKA Baobab. Compare the space used by the files there with the size of your unallocated space. If the unallocated space is larger, You can simply create a new partition in the unallocated space, move the content of the large directory there, freeing up space on your / parition and then mount the newly created partition at the source directory. If anything about this answer is unclear or you need assistance in it's application, feel free to drop me a comment and I'll do my best to clarify/assist. Not the answer you're looking for? Browse other questions tagged dual-boot partitioning gparted ext4 17.04 or ask your own question.